G & S Electric, Inc. is a family owned and operated electrical contracting company based in greater Phoenix, Arizona and has been serving Arizona since 1986. We’re licensed, bonded and insured electricians. Quality is our calling card and is evidenced by our A+ rating with the BBB, as well as top notch ratings by Angie’s List. We handle small jobs like outlet repair and ceiling fan installation all the way up to larger commercial/industrial service and maintenance projects. G & S also specializes in creating customized PV Solar Operations and Maintenance (O&M) planning. Our solar projects range from small residential systems to large commercial/industrial systems and we are experts at both on grid and off grid systems. Whatever your needs for electrical contracting, we’ve got you covered. G & S holds itself and its staff to the highest standards in professionalism and reliability. Our skilled technicians will be on time and honest at every install, repair and electrical project we are involved in. Our electricians have passed extensive background checks and are routinely drug tested. All electrician Journeymen have completed 5 years of training in an accredited program and are required to attend continuing education classes. All employees have completed first aid and CPR training. All employees are certified by the Southwest Safety Training Alliance (SSTA).. G & S Electric, Inc strictly enforces a Drug Free Workforce Program. 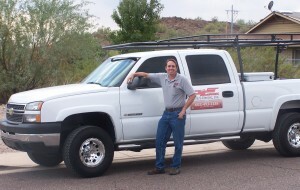 Call us today at 602-493-1135 to get our top Phoenix Electricians working for you!